The perfect lightweight, super comfortable hoodie that's sure to be a go-to regular in your outerwear collection. Delivering soft comfort in a classic design makes it a versatile layer ideal for everyday wear in any weather. This long sleeve pullover is made from soft french terry fabric for all-day comfort. 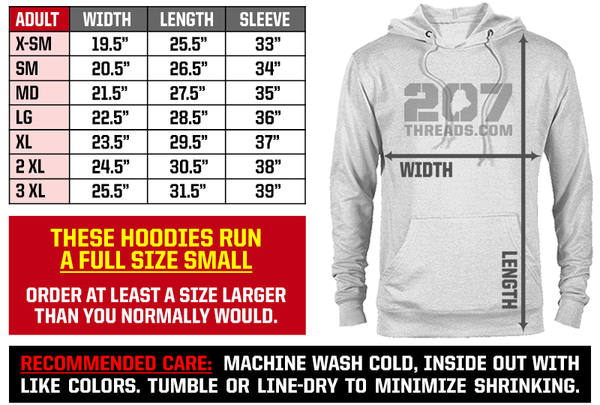 A nice and affordable light hooded sweatshirt that not only feels great, but looks great too. French terry style hoodies are lighter in weight and more comfortable than traditional heavy sweatshirts. The interior is soft but not fuzzy so there's less bulk and no pilling. Its unisex cut is flattering to both men and women, so feel free to outfit the whole family for your next adventure! A great gift idea or souvenir to remember your favorite vacation, or for showing off your hometown pride and repping your roots in style! These RUN SMALL so order a size up!